Best kept as a dry bean but can be used earlier as a green bean. 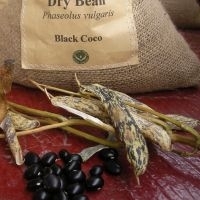 This variety matures quickly to a large black bean with good flavour and texture. The most reliable and earliest to mature dry bean that we have found. Whole plants can be harvested when the pods turn brown and the drying process finished indoors. Average 30 seeds/packet.